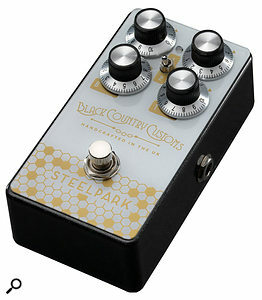 The description 'boost pedal' actually does the Steelpark something of a disservice, since it's also a very sophisticated and flexible low-gain overdrive that works with your amp to recreate a variety of classic tones. There's plenty of fairly clean volume on hand with lots of headroom if you just want to push the front end of your amp, but the gentle drive capability of the pedal is very seductive, and it could be used before other more assertive drive pedals if need be. The all-analogue circuitry has a clean buffered bypass to avoid tonal loss in typical pedalboard setups, and power can be supplied by battery or optional PSU (the usual 9V, Boss-style connector). A tri-colour LED tells you what mode the pedal is in and the battery life is around 30 hours. The footswitch operates silently too, which is always welcome. The control setup comprises four knobs and a three-way Mode switch, the latter selecting between three voicings. Mode 1 adds mid boost, mode 2 adds a low‑mid boost, and the third mode leaves the voicing flat. These three modes are denoted by the LED showing orange, blue and purple, respectively. As expected, two of the knobs look after drive and volume duties with the other two assigned to bass and treble EQ. With any boost or drive pedal, it's the way that it reacts with your own amplifier that really matters. Pushing the front‑end of your amp to encourage more natural overdrive can be very effective, especially if you have a valve amplifier, but different amplifiers 'push' in different ways. I generally use a Roland Blues Cube, which hasn't been within arms length a valve, so I set it to clean in order to see what the pedal's drive section sounded like when it was doing all the work on its own — and I have to say I was extremely impressed. Using a Strat, even the maximum drive setting adds only a modest amount of 'hair' to the sound, but it does so in a very organic and touch-responsive way that also feels to be slightly compressed and nicely 'springy'. Flip to the neck pickup and you have the gentler side of Jimi Hendrix nailed — move to the bridge and suddenly you find yourself windmilling and playing Who covers. And yes, it does a fabulous 'Shine On' nearly‑clean sound. Having the three tonal options also helps greatly in matching the character of the drive to your pickups, after which you can finesse the tone using the bass and treble controls. With humbuckers the overdrive can reach up into the more refined areas of classic rock, where the tone controls can again help to avoid muddiness. I started off this review thinking this would be yet another overdrive pedal — but ended up thinking I really might need to add one of these to my pedalboard! This really could be the sweetest sounding low-gain overdrive I've come across to date.